That recipe title is a mouthful, but really I find it hard to describe this salad otherwise. Think sweet, yet tangy and oh so refreshing. 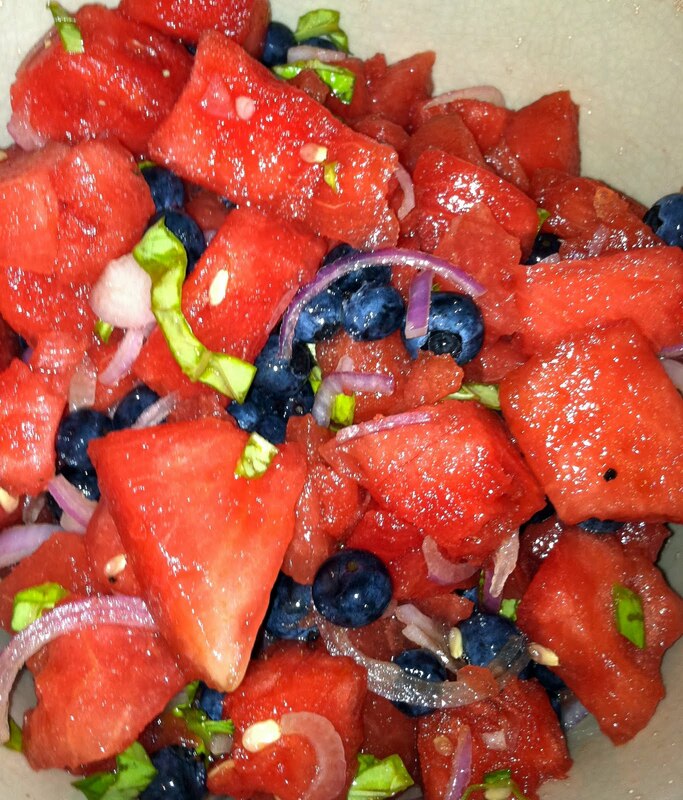 Tart blueberries that pop in your mouth against soft, bright pink, sweet watermelon and red onion, sliced paper thin. All pulled together with fresh basil and a splash of balsamic vinegar. Take this salad to your next potluck picnic and come home with an empty bowl! 1.) Place the watermelon in a large bowl. Add the blueberries, onions and basil. Pour the balsamic vinegar over top. Sprinkle with a pinch of salt and few cracks of black pepper. 2.) 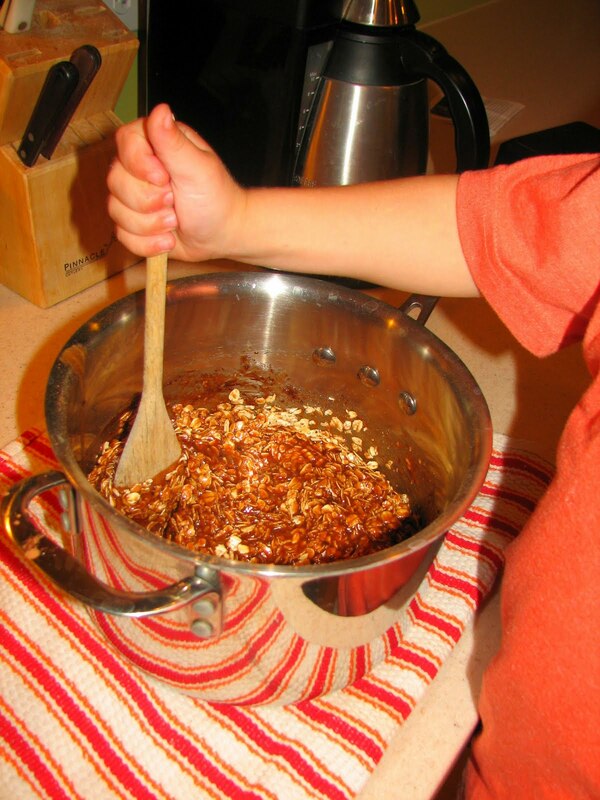 Using two large serving spoons, gently combine. 3.) Yummiest when the ingredients have had time to marry and marinate before serving. Best when served chilled. 4.) If you're going to make this the night before, chop the basil and add it as you head out the door so it's still nice and green when you arrive at the picnic. If you use a sharp cheddar, like Cabbots, with lots of flavor you don't need much to make a difference. Of course, the kids are just as happy with the inexpensive bag of shredded cheese, so whatever. When the cheese is melted and the under side of the wrap is lightly browned, fold it over on itself and serve with the salsa and chips. One of these days I'll remember to get a picture of the finished product before we eat it. Really though, don't we all know what a quesadilla looks like? 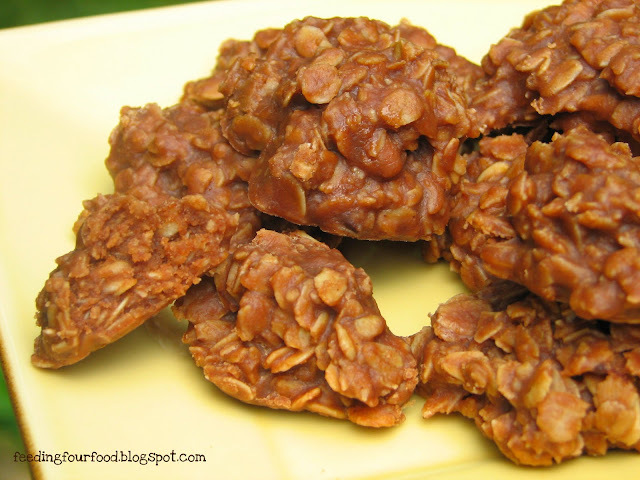 If your kids won't touch black beans omit them or try a dollop of fat-free refried beans. I also cut these into wedges and call it pizza, which the baby loves. My oldest is not big on the quesadillas right now, but he'll eat this salsa like a salad with a fork or on chips. I can always hope he warms up to the quesadillas, because this is a quick, nutritious, meat-free dinner that (just about) everyone loves. 1.) How easy is this? Once you've chopped your ingredients, all you need to do is toss it together in a bowl. I like to chop everything in fairly large chunks, but you can also pour this in your food processor. 2.) If you have a jalapeno on hand and your kids don't mind the heat, you can add that. I don't bother with them since I get enough heat out of the onions and garlic for our tastes. 3.) Start with 1 Tb of sea or kosher salt, less if you're using table salt. Taste before adding more. I added about 1 1/2 Tb of sea salt to this batch and it was nearly too much. 4.) I also like a splash more acid in my salsa, hence the red wine vinegar. Fresh lime juice is best though if you have it, or lemon. And now for a funny picture and story. A neighbor dropped in once when I was cooking and I answered the door with this knife in my hand. He took two steps back and started talking real fast. Sorry! I was in the moment. You gotta love the tomato splatter marks underneath the eviscerated cucumber above though. Sometimes I scare myself. 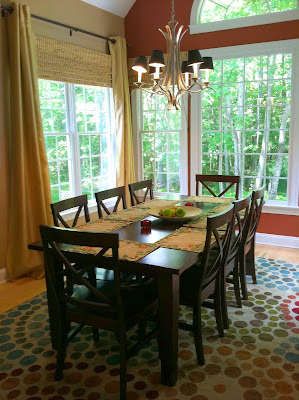 I haven't completed the final step in redecorating the dining room--lowering the chandelier--but it's time to check this project off my list as 'complete.' Some day, but probably not some day soon, we'll get an electrician to complete our short list of projects around the house. Oh well, moving on! Here are the end chairs I chose. I LOVE this room and am very happy with how it turned out. 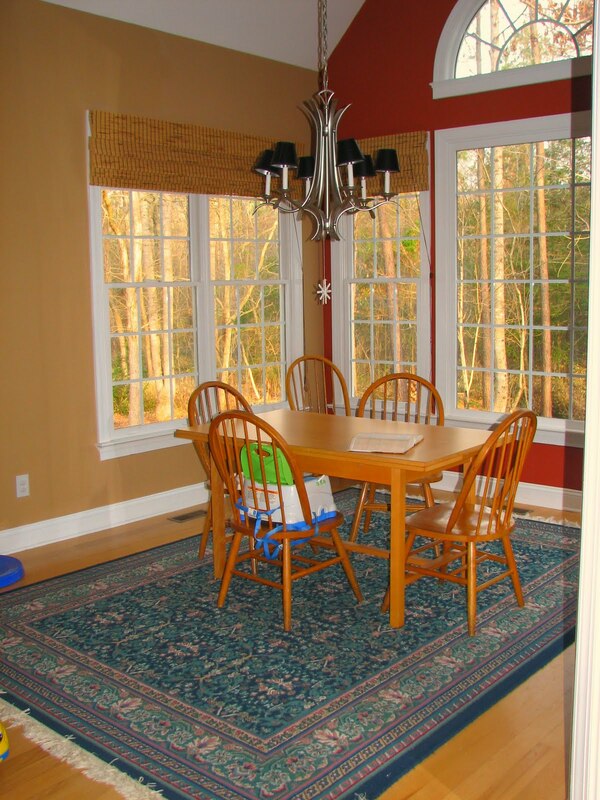 The table, rug and drapes are grown up and vibrant without being formal. Still everything is washable, stain resistant and pre-dinged for the kids. 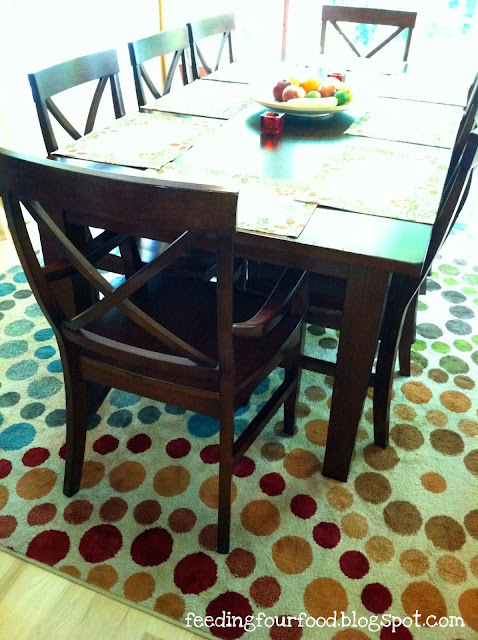 Finally, I love that the room reflects my personality and tastes without being too girly. I may be outnumbered, but this dining room says, "A woman lives here!" I mentioned a few posts back about the art wall we have, and I thought I'd share this view from the other side of the dining room. This is our "Free Expression" wall, for those N.C. State grads out there. Luckily, we don't have to worry about UNC fans sneaking into our house and painting it sky blue during play-offs. 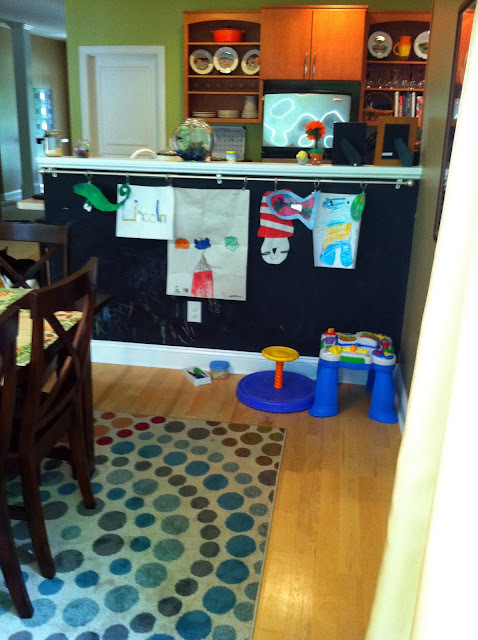 When the kids get the urge to draw on the walls or furniture, we hand them chalk and direct them here. I love the stuff they come up with and they love showing company their art gallery. 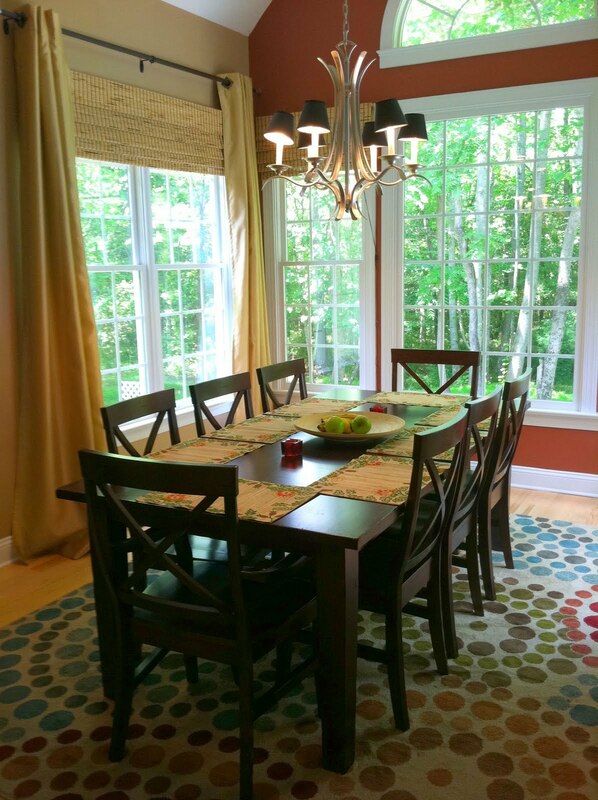 At this point, I figure you're tired of seeing pictures of my dining room. So let's finish this series with a final, satisfying "before" and "after." Tada! Tell me about your favorite food-related iPhone apps! I just got an iPhone. I know, I'm late to every party. I was really just waiting to get the white ones. Uh-huh. So, I have figured out the basics, including using the camera, which has been a huge help for this blog. That old Canon was starting to get heavy. I am, however, overwhelmed by the app store and would love some suggestions. I'm using Mapquest and Urbanspoon already for finding restaurants. I'm also looking for 1.) anything that will help make couponing easier and paperless, 2.) 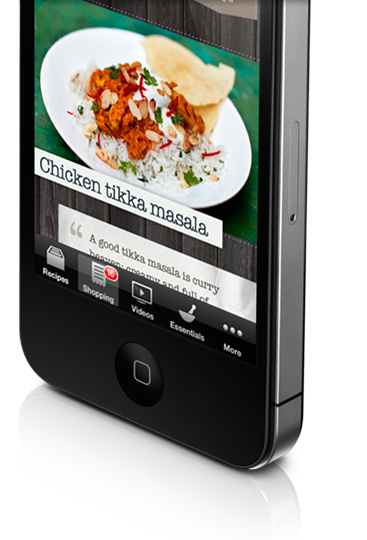 nifty cooking apps, 3.) something that will help make grocery shopping and list making easier. Thanks! You can leave your suggestions in comment form below. 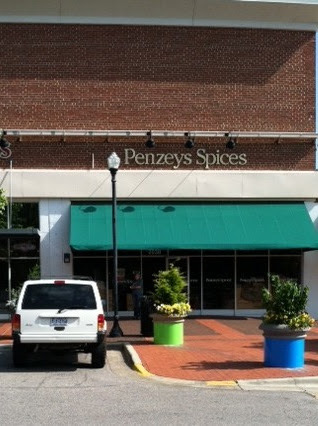 Penzey's Spices has come to Raleigh! You didn't know? Shame on you. Okay, their Raleigh shop opened in November and I just heard about it from my Mom, who lives in New York, so you're forgiven. Penzey's Spices, well, sells spices. From Adobo and Ajwain to Chinese cinnamon and pure vanilla extract, the Penzey catalog and Web site are an inspiring and sometimes bewildering source for spices and spice mixes from all over the world. 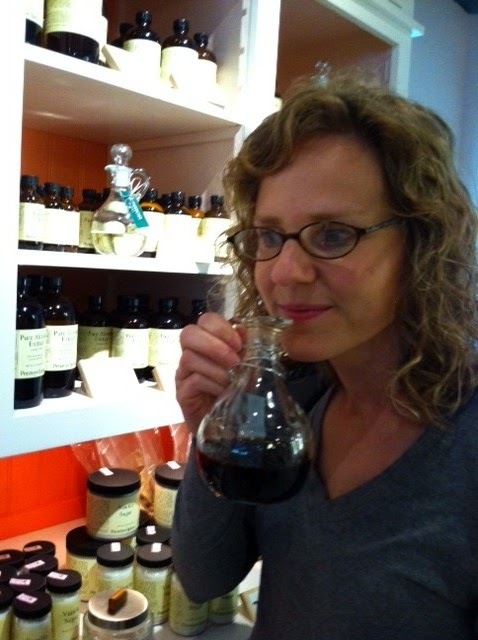 But what's very cool about Penzey's is their laid back, home-cook approach to food and their special blends. Mom came down to visit recently and we took a trip over to Cameron Village to check out the new store. The store is located near the Accipiter and the Flying Biscuit Cafe, facing Clark Street. The layout is simple and easy to navigate with a 1950s faux kitchen in the back that displays the baking spices and ingredients. Most of the spices can be purchased in 1 oz. and 2 oz. glass jars (1/4 and 1/2 cup) or 4 oz bags. Sample jars were available for sniffing (sorry, no taste tests that I saw). The best bang for your buck seems to be the 4 oz bags. For instance, a 4 oz. bag of the Italian Vinaigrette dressing blend, which comes with instructions on how to add the dry spice mix to oil, water and vinegar for your own homemade dressing, cost $4.59. There's a similar product at the grocery store called Good Seasons Italian Dressing that will cost you $1.85 for a single .07 oz. packet. So in that way, the spices can really save you money. Of course, items like real double-proof vanilla are going to cost you more than the imitation stuff. I particularly loved the high quality baking spices and the herb blends, which I plan to use on all the veggies we're eating this summer. The fun of the Penzey's store, though, is in sniffing all the tester jars and talking to the ladies that work there about food. My Mom and I talked with Dawn and Jenn that afternoon and found that not only do they know about spices, they love to cook. We waxed poetic for a while about food and cooking and family and got advice and information about the different products. Bill Penzey, owner of Penzey's Spices has a wholistic, down-to-earth approach to food and cooking and his attitude is evident in the store and with the people who work there. This is not a gourmande's, hoity-toity store, despite its Cameron Village location. These are spices for people who like homemade hot cocoa from high-fat natural cocoa powder and a great BBQ spice rub for grilled meats. I walked away with a French vinaigrette dressing mix and Green Goddess creamy dressing mix, a bag of the high-fat natural cocoa powder, the Sunny Paris vegetable seasoning and several sets of Mother's Day gifts. Lots of yummy possibilities.When we checked out with our finds, the cashier slipped bumper stickers into the bag that read, "Love people. Cook them tasty food." Hey, I couldn't have said it better. If you're in the area and have the kids in tow, think about stopping by real quick at Penzey's anyway, depending on the age of your kids. I left my two-year-old at home,but the staff encouraged me to bring him next time. 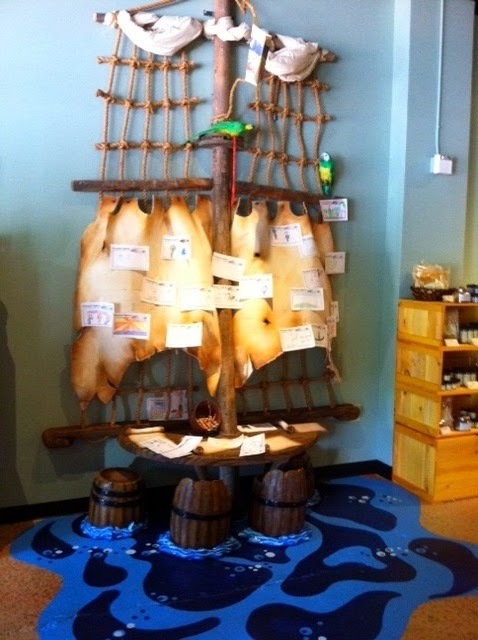 They do have a cute pirate ship area where the kids can color picture. 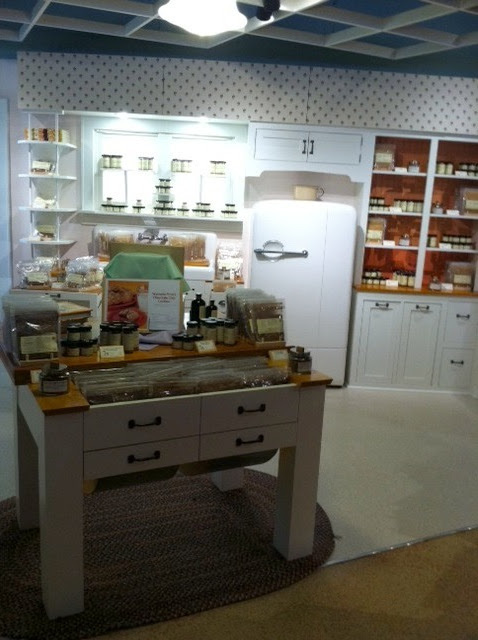 However, imagine crate after crate of glass jars and bags of spices all at toddler eye level. Yikes. I think I'll keep my Penzey's trips all to myself for now. You might want to chalk this up to TMI, but I know I'm not the only woman who craves chocolate at least once a month. OK, I crave chocolate daily, but I'm talking in-my-pjs-with-a-movie-and-an-entire-pan-of-brownies-smothered-in-fudge-sauce craving. And I'm not getting up until the pan is clean and God help you if you get in my way. That kind of craving. And it hit me totally unprepared last night. No brownie makings, no baking nothin' anywhere in sight. But back in the corner of my pantry I found leftover s'mores fixings: one-and-a-half stale graham crackers, a couple of squares of chocolate and half a bag of marshmallows. Perfect. So here's how it works, as if you aren't already doing this yourself in secret. I don't like the graham crackers microwaved. So I nuke the chocolate squares on a microwave-proof plate for 10 seconds, then add a single marshmallow on top and let it go another 10 seconds. Then I scrape the oozing lot off the plate with the graham crackers and reload. Ahhh. Craving abated. "I want you to give up, Mommy. Just give up!" "When I have kids I'm not going to treat them like this." "I don't want to spend the rest of my life in this puny little room!" "Mommy, put the rear-view mirror down. I want you to see how sad you've made me." Good grief. And then there are the good days, when he says the most beautiful things. Like when I was watching Julia Roberts and Javier Bardem in Eat, Pray, Love and he said, "Is that you and Daddy?" Why, yes. Yes, it is. 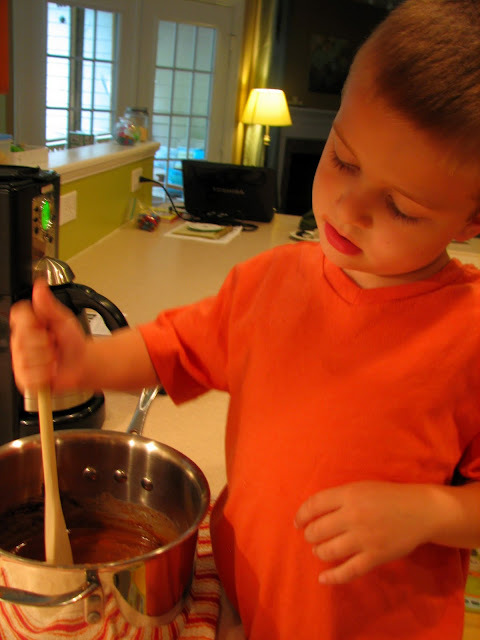 I've baked with Linc since he was a baby. I propped his little vibrating seat up on the counter (sans vibrations) and talked to him while I worked. As he got older he moved to a chair or stool and got his own apron and chef's hat. But lately he's lost interest. He's moving on to big boy things I guess, like soccer and science and video games. Then the other day he looked at me and said, "Mommy, can we bake cookies together again?" We spent the next half hour, side-by-side, talking while we worked. He's big enough now to help measure out the ingredients and stir the pot under my careful watch. While we waited for the cookies to cool on the parchment paper, we played a game of Trouble and washed the dishes in the sink together. These are the times when I remember that cooking is about more than nutrition and calories and dirty dishes. Cooking is about shared memories and spending time with the ones we love. 1.) 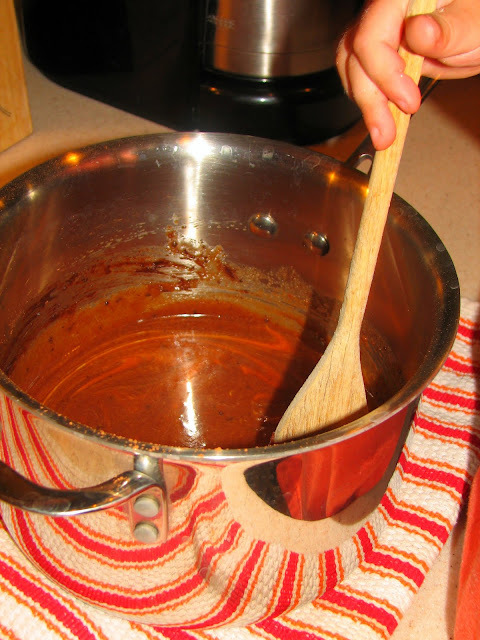 In a saucepan on low to medium heat, combine the cocoa, sugar, milk and butter. Stir until cooked and the sugar disolves. It won't sound or feel gritty anymore and all the butter will be melted. This is probably the most important part of this simple process. If you don't let the sugar cook long enough you'll have gritty, sugary cookies instead of chocolate peanut butter fudge coated oat cookies. 2. )Remove from heat. Add in the peanut butter and vanilla and stir until the peanut butter is melted. 3.) Stir in the oats until well coated. We use whole oats instead of the quick oats but both will probably work well. 4.) 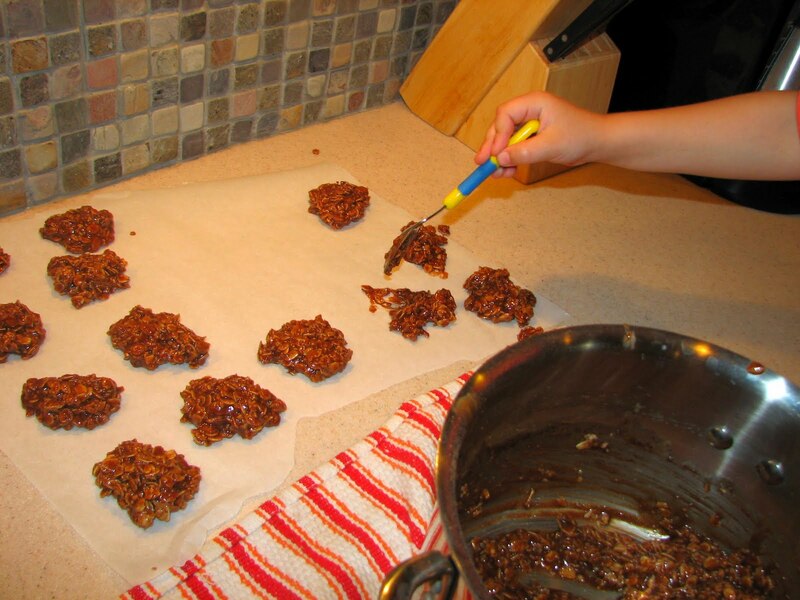 Spoon out the dough onto wax or parchment paper and let cool at room temperature for about half an hour. Cookies will set and be easy to remove from the paper without crumbling when they're ready.